India will not rescue the global economy in 2016. The subcontinent’s expanding GDP is one of next year’s few economic bright spots. But Indian output is still too small. Any negative shocks from the sluggish United States and decelerating China will reverberate more widely. India is finally emerging from China’s shadow in the global growth stakes. Helped by a controversial overhaul of its GDP statistics, the Indian economy probably expanded by 7.5 percent in 2015 and is set to swell by a further 7.8 percent in 2016. Contrast that with the People’s Republic, which is struggling to maintain the near-7 percent pace promised by its leaders. The prospect of sustained rapid growth has drawn the attention of prominent central bankers. India’s economy has “enormous potential” to recharge Asia’s growth engine, Stanley Fischer, the U.S. Federal Reserve’s vice chairman, declared in a recent speech. For now, however, the country’s economic progress has relatively little impact on the rest of the world – although it is enormously important to India’s 1.3 billion citizens. The economy accounts for little more than 3 percent of global output, according to Breakingviews calculations based on World Bank forecasts. China is almost four times as large, while the United States is still responsible for more than a fifth of all economic activity. 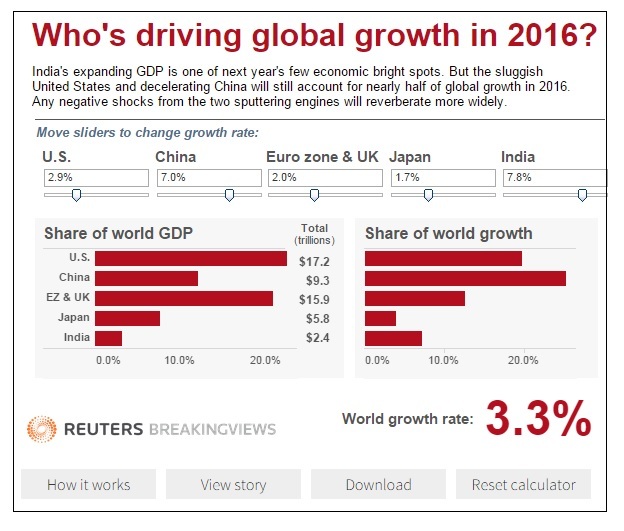 On current projections, India will produce about 7 percent of global growth in 2016 while the United States and China will together be responsible for about 45 percent of GDP expansion. Put another way, India’s growth rate would need to rise by about 3 percentage points in order to add 0.1 percentage point to next year’s expected global growth rate of 3.3 percent. China could have the same impact with a 1 point increase in the pace of expansion. For the United States, an extra half point would suffice. With Europe stuck in the doldrums and Japan struggling to recover, the world economy still depends heavily on its two largest growth engines, both of which are sputtering. A severe slowdown in China or a stalled recovery in the United States would be felt around the world. By comparison, India’s economic performance, no matter how impressive, will barely register. India’s economy has “enormous potential” to recharge Asia’s growth engine, Federal Reserve Vice Chairman Stanley Fischer said in a speech on Nov. 19. Fischer pointed out that India is relatively unintegrated into the world’s manufacturing supply chain, and that productivity gains could allow the country to maintain a relatively high growth rate for many years. It also has the benefit of a relatively young population. However, Fischer warned that India would need to overcome many roadblocks to achieve its potential.